The Adhi Kumbeshwarar temple is located is located in Kumbakonam and is a Hindu temple dedicated to the worship of Lord Shiva. The Lord is seen in the form of Adhi Kumbeswarar and is worshipped in the form of the Lingam. The temple has been existing ever since the century during the Chola reign. The city of Kumbakonam derives its name from the Adhi Kumbeswarar temple. The famous Potramarai tank is located in front of this temple. During the Mahamaham festival, which takes place once every 12 years, devotees take a dip from this tank. During a Tsunami destruction, the world was facing huge devastation. Lord Brahma asked Lord Shiva where from he should restart creation. Shiva told Brahma to take a pot filled with sand collected from many sacred places and float it in the flood water. The pot at one point stopped and Lord Shiva shot an arrow and nectar spilled on all the directions getting mixed with the sand which became a Linga. This Linga became the main deity at the temple. 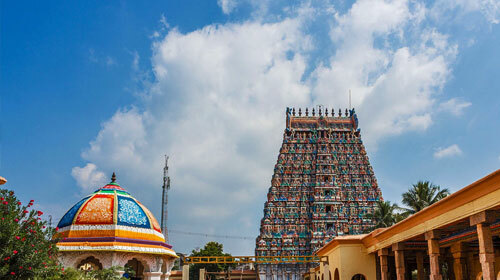 Sabthasthanam festival during the Tamil month of Chithirai is celebrated here where the Lord and his consort Mother Goddess visit seven places within a distance of seven kilometers. The Thirukalyanam festival is celebrated during the months of May – June. Other special days such as Adi Peruku, Adi Pooram, the Panguni festival and the Tirumanjanam are celebrated with special pujas. The procession of the Panchamurthis is a festival which is celebrated in a grand manner here.